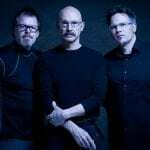 KBCS’s Carol Handley speaks with bassist and Chapman Stick player Tony Levin about some of his key relationships throughout his career musical career. Tony is best known for his work with Peter Gabriel, who he has been with since his first album was released in 1977. He has also been a member of the band “King Crimson“, a progressive rock band, since the early 80’s.